Covering the lighting industry’s best installations, opinions, products and more. Radical Dining: Bespoke Solutions to Enhance the Culinary Journey. View on the lighting industry’s Installations, products, people, and Events. You can also refer to the Digital Magazine and latest news, features, projects and designs from the UK lighting industry at the website of Total Lighting Magazine. Total Lighting Magazine is one of the main tools chosen by professional lighting designers. After nine years the magazine is a well-established brand in its own right, providing strong and vibrant editorial comment, together with up to the minute news articles and the latest project and product information, both in the UK and further afield. 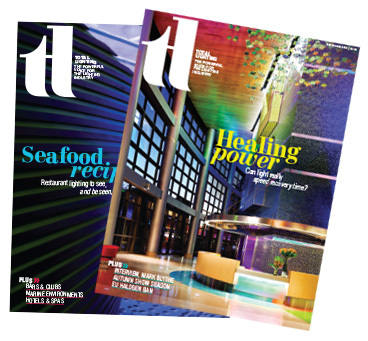 Total Lighting Magazine prides itself on its close links with industry heavyweights, as well as designers, architects, lighting retailers and manufacturers, who it collaborates with in order to keep the reader up to date. It was the first lighting design magazine in the UK to produce a fully interactive digital edition,and readers can benefit from an archive that now goes back more than four years.